Below you can view all the townhomes for sale in the Carolina Walk subdivision located in Mount Pleasant South Carolina. 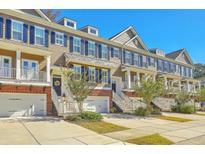 Listings in Carolina Walk are updated daily from data we receive from the Charleston multiple listing service. To learn more about any of these townhomes or to receive custom notifications when a new property is listed for sale in Carolina Walk, give us a call at 843-306-2224. Gourmet KitchenAid stainless appliances, wood floors on the main level, Cherry cabinetry, granite countertops, bronze fixtures / hardware, and much more! A must see! MLS#18033446. Palmetto State Properties & Associates Llc. The first floor is perfect for guests or a mother in law suite with a generous size room, full bath, and... MLS#18028851. Keller Williams Realty Chas. Islands. Many conveniences are nearby with Town Center being across the street. MLS#18018005. The Cassina Group.